Mei-Lyn Bautista entered the night as GW's leading scorer, but was held scoreless in GW's loss to No. 9 Maryland Wednesday night. Three of GW’s five starters were held scoreless in GW’s loss to No. 9 Maryland – the team’s lowest scoring game in more than four decades. The Terrapins’ (3–0) defense stifled the Colonials (1–2), holding them to a season-low 17.5 field goal percentage while forcing 17 turnovers and collecting 14 steals. GW lost 69–30 on its home court, marking the lowest scoring game since the team’s 51–25 loss to Howard on Jan. 27, 1976. Senior forward Kelsi Mahoney collected a team-high 12 points on the night. Senior guard Mei-Lyn Bautista, GW’s leading scorer heading into the match, was rendered scoreless by Maryland’s defense but led the team with eight rebounds and two steals while tallying two assists on the night. Redshirt sophomore forward Sarah Overcash and sophomore forward Chyna Latimer both started the game but were also held without any points. The Terrapins were led by senior forward Brianna Fraser with 16 points and freshman forward Shakira Austin with 12 rebounds. Maryland ended the night shooting 46.3 percent from the field and out-rebounding the Colonials 52–37. The Terrapins scored 48 points in the paint. Maryland, the first top-10 team to visit GW in four years, is considered one of basketball’s long-standing powerhouses, with three Big 10 Conference Championships under its belt in the last four years. The Colonials started out strong with back-to-back threes by senior forward Kelsi Mahoney to push GW ahead 6–2 with eight minutes left in the first quarter. But Maryland’s defense quickly made its presence known, forcing multiple turnovers and limiting GW to just two more points in the frame while pulling ahead 18–8. 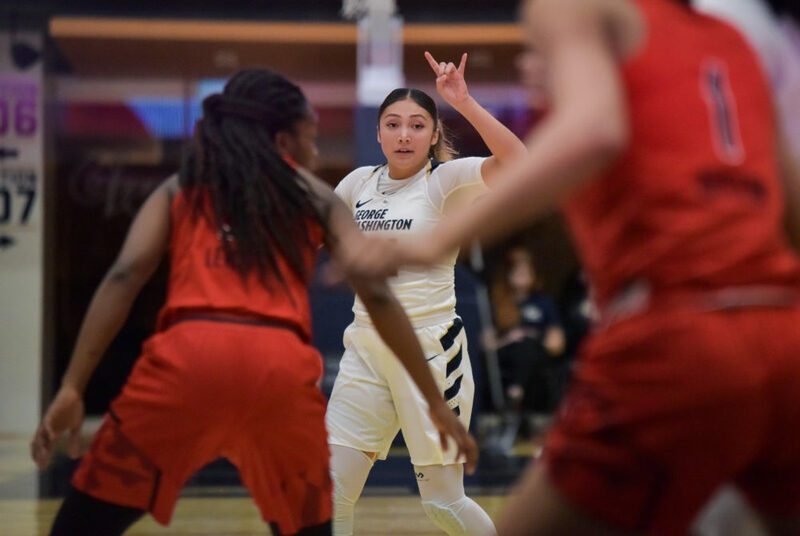 The Colonials failed to score more than two points in the paint during the first half and trailed the Terrapins 40–15 at halftime. Heading into the break, Maryland’s bench scored more than GW’s entire team. GW’s lone points in the third quarter came off a three-pointer from freshman guard Maddie Loder. With nine blocks and 52 rebounds, Maryland’s defense effectively shut down the Colonials in the paint, allowing them to score a total of four points from the key. Half of GW’s points came from the perimeter. In GW’s previous two matches this season, the Colonials limited their opponents to 50 points or fewer. The Terrapins broke that record six minutes into the third quarter, but their 69 points scored is their lowest tally in a game so far this season. Rizzotti said part of her team’s ability was to limit the Terrapins’ offensive rebounds. Despite the result, Rizzotti said playing against a high-caliber opponent gives her players a taste of the level of play Rizzotti hopes to see GW achieve. The Colonials return to action Sunday when they face Iona on the road. Tip-off is slated for 1 p.m. This article appeared in the November 15, 2018 issue of the Hatchet.